What are the best flyers for new real estate agents so they hit the ground running? This post is going to show you how to create real estate flyers quickly and easily, even if you’re a new agent. If you want to really hit the ground running in your new career, please DO NOT circulate a letter saying you’re new to real estate and you’re looking forward to getting to know the homeowners in your local area. Think about it; Would you place an asset worth many hundreds of thousands of dollars in the hands of someone that sold TVs at Best Buy or drove an Uber car the month before? Of course not! No part of that computes and when I see one of these newbie letters in my mailbox every so often, I can almost smell a real estate career going up in smoke! Okay. End of rant. Let’s get to what you’re here for. Any new agent will tell you that kicking off a real estate career can be mind-boggling, confusing and even somewhat intimidating. Many new agents are not sure how to use their time to get results and fall into the trap of being exhausted/frustrated at the end of each day. Perhaps this might be why many agents don’t last that long in real estate and move on to something easier. But the new agent that starts to win results right from the beginning of their career experience more confidence and job satisfaction as they quickly learn what works and what doesn’t. It’s also essential to determine what you actually want your real estate flyers to do. What specific outcome are you hoping to achieve? My suggestion would be to attract and record as many new contacts in your area as possible. Quite simply, that should be your mission. Many new agents fall for the trap of only looking for ‘now’ sellers instead of focusing on building relationships with people who either might be selling at some point in the future or who will be looking for an agent to refer to a friend or relative. In the marketing world, a CTA or Call-To-Action is a critically important part of your communication. You’ll notice how each of the four flyers for new real estate agents features a strong, clear and compelling CTA. So here’s a guide to help new agents get results faster results right from the very start of their real estate career. 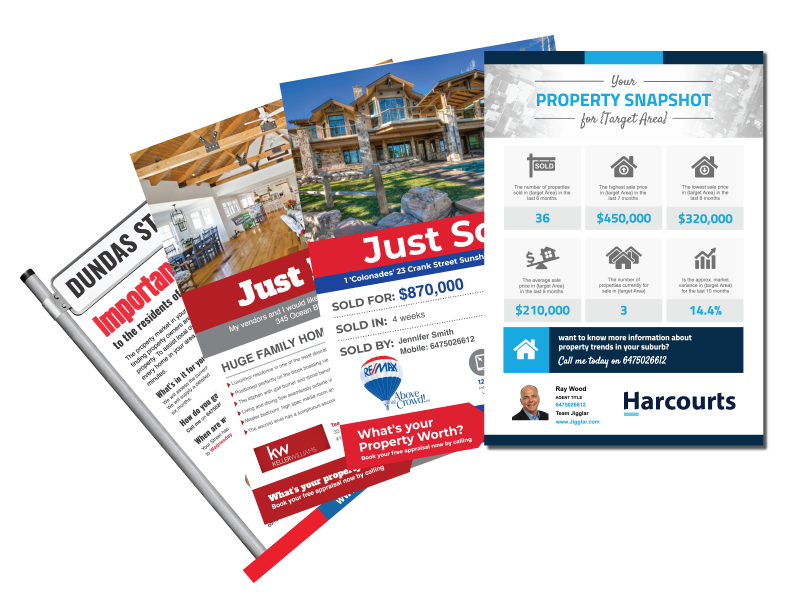 I’ll give you the heads up on the very best flyers for new real estate agents, how to create them and how to target your market to get maximum results. The creative and marketing teams at Jigglar work closely with Jigglar agents to establish which real estate flyers generate the best results and why. Jigglar is very different from any other marketing company because it concentrates 100% of resources and attention to help real estate agents win more listings and make more sales. Jigglar agents tell us that the Street Sign Flyer is a consistent performer as a generic letter drop into specific geographic markets. We’re told that images are 60,000 times more likely to attract the attention and therefore generate response than written words or copy. The Street Sign flyer works because it quickly communicates a keyword that will evoke a response from a potential seller. Jigglar agents have the option of using an actual Street name on the sign or a suburb or even area. This Flyer for new real estate agents has probably helped more Jigglar agents get their first listing than anything else in the store! If you’re not the local legend in your area just yet, don’t worry. When it comes to flyers for new real estate agents, Jigglar’s got your back. 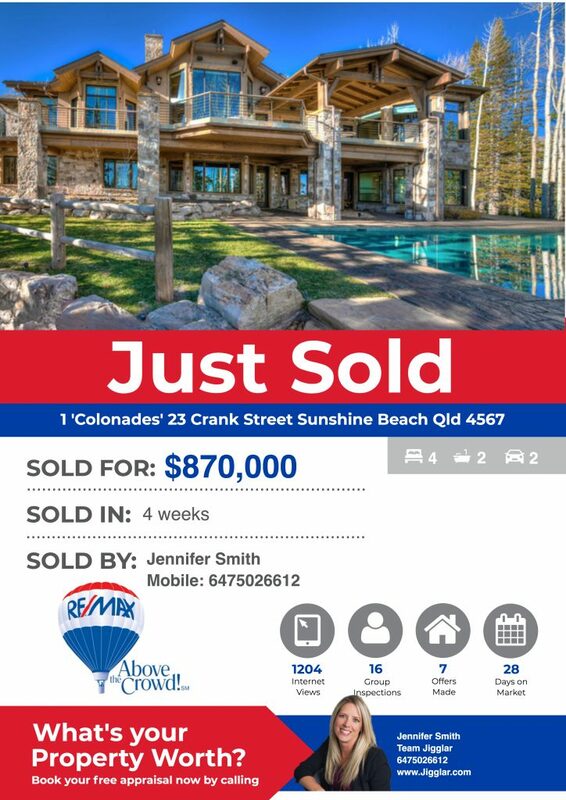 One of the best ways to boost your professional authority and credibility is with Just Listed and Just Sold flyers. More about those soon. 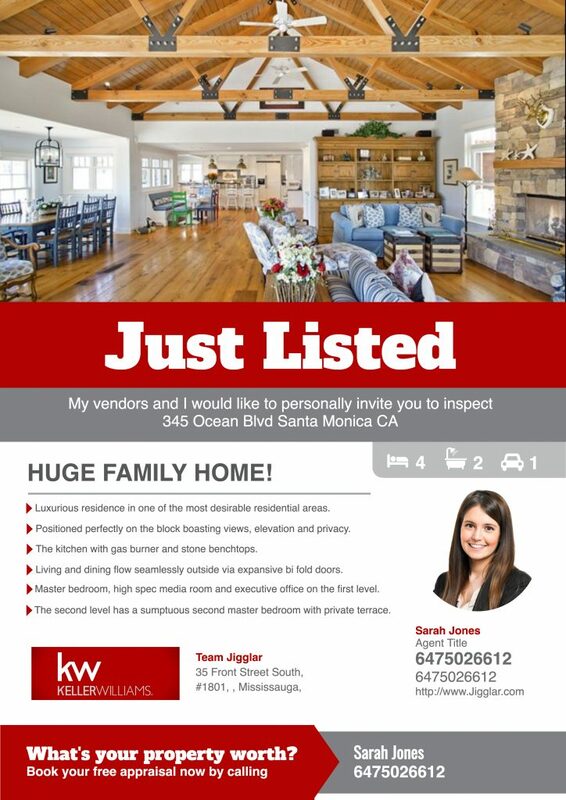 So here’s another awesome real estate flyer that’s proving very popular with agents at every level of their career. 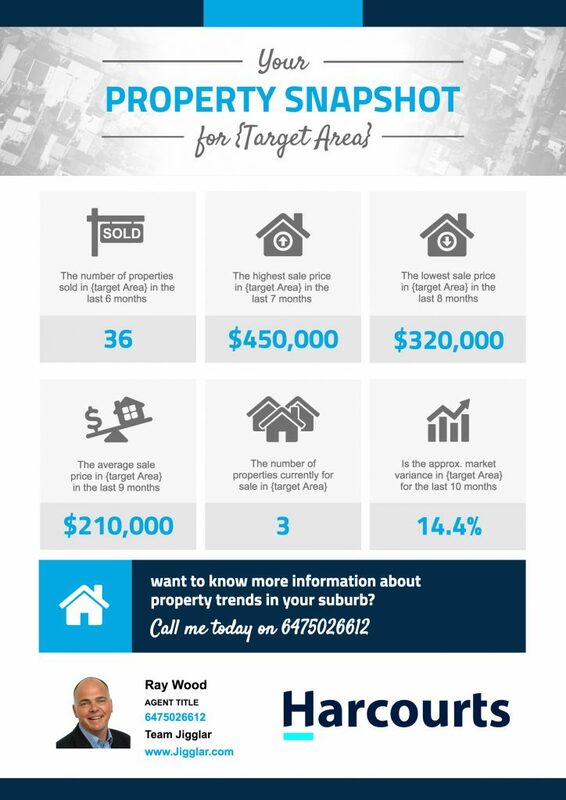 The Property Snapshot shows your intimate local area knowledge in the form of a cool infographic. It’s a creative way to show your obvious awareness and also clearly illustrates you have your eye on the real details that matter to every homeowner. 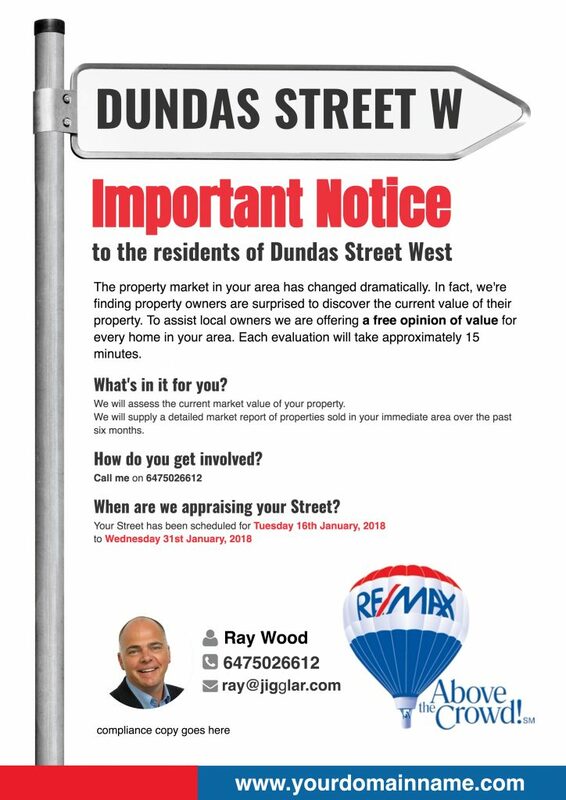 It can be a generic letter drop to homes in your area, a Facebook post and something you hand out at open homes and as part of your pre-listing kit. There is NOTHING Like the authority that comes with promoting a recent sale or new listing in your area. When another potential seller sees a Just Listed or Just Sold flyer, they can quickly understand another seller has had the confidence in you as an agent to market their property so why not join them? Okay, you might not have got the actual listing or made the actual sale yourself but someone in your office will have, so just ask if they wouldn’t mind if you did a bit of prospecting around their listing or sale. If you really want a listing, try door knocking with your flyers and offering the same message verbally.